Capital Cities USA Journey Across America | Happy Birthday! Linda Burton posting from Tallahassee, Florida – The first day of the year is a perfect day for reflection. A glance over the shoulder and we can still glimpse the past, even though our feet are firmly pointed towards the new year ahead. But this year Floridians are giving the past much more than a quick glance; you see, it’s Florida’s 500th Birthday and Viva Florida 500 is about to begin. It was 1513 when Juan Ponce de Leon arrived on Florida’s east coast; the first group of Europeans to document such a landing, and to name the place La Florida. Florida’s documented material history dates back more than 12,000 years, but Spain’s claim in 1513 began a new era in human history; it was the foundation that eventually formed the United States of America. The legacy of Spanish Florida started with Ponce de Leon and continued when Pedro Menendez founded St Augustine in 1565, the oldest continuously occupied European settlement in North America. But Spanish explorers were not the only ones; the French established Fort Carolina in 1564; and the British displaced the Spanish in the late 18th century. Under these various flags lived settlers of multiple nationalities; today a number of different cultures thrive in Florida. 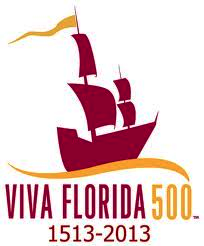 Viva Florida 500 is about them all, celebrated with a year-long, statewide, big birthday bash. The Florida Department of State and many partners are planning events and experiences across the state throughout the year. One of them is happening today; Expedition Florida 500 launches its year-long journey in Pensacola. 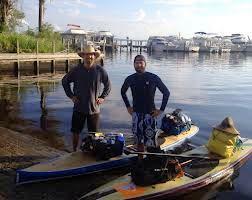 It will be a 365-day exploration of Florida’s coastline and waterways; the first half of the year the team will explore the coastline, stopping in local communities, hosting waterway cleanups, and filming Florida’s wildlife and scenery; people are invited to paddle along. The second half of the year the team turns inland along Florida’s rivers, lakes, and marshlands; they’ll camp and airboat through the Everglades and canoe natural springs, engaging with the public along the way. You can follow their journey at www.fb.com/XF500 . One exciting idea for getting every community involved in this year’s big birthday bash are the Viva Florida 500 time capsules – one for each of Florida’s 67 counties. 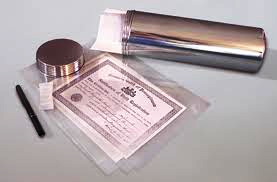 The Florida Department of State’s Division of Library and Information Services is providing a time capsule to every county library in the state. County commissioners will work within their communities to help decide what will go in their capsule; it will be a collaborative decision, of course; choices made could influence how history is interpreted in the future. Counties may decide on setting a “do not dig before” date, such as 50 years or more. Maybe 500? Locations are encouraged to register the location with a repository such as Oglethorpe University. Museums are doing their part for the celebration too. The Museum of Florida History in Tallahassee has established a new permanent exhibit – Forever Changed: La Florida 1513-1821. It covers the era of Spanish possession. Future exhibits this year will document the British period, and Florida’s acquisition by the United States. 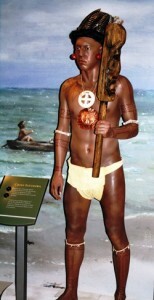 The story begins with the natives who were here in 1513; perhaps as many as one million people. The portion called “Land of Many Cultures” highlights the Timucua, Apalachee, and Calusa tribes; although these native peoples shared important cultural traits, there were many differences as well. In “Spanish Exploration,” visitors can walk on a dock in a scene reminiscent of the loading of a ship traveling to La Florida. The pier leads to a reproduced portion of a Spanish ship; visitors can learn about navigation and life at sea. The third section is called “Meeting of the Cultures.” Life-size figures represent the diverse people who experienced 16th-century Florida. Maps show locations of settlements in La Florida and trace routes of the explorers; artifacts lend evidence of the 16th century European presence in Florida. In addition to text panels, murals, recreated settings, and three-dimensional objects and artifacts, the exhibit features interactive activities. The Museum will extend the exhibit in future phases, eventually bringing the story up to 1821. Subjects to be featured during the continuation of the project include settlements, missions, and forts, the British period, and the second Spanish period. For further information see http://www.museumoffloridahistory.com/index.cfm . Navigating New Worlds: Identity, Perception, and Politics in Florida will be an intriguing part of Viva Florida 500. Approximately 30 rare and historically significant maps from the Michael and Linda Fisher collection will be on display from January 17 until December 31 at the Florida Historic Capitol Museum in Tallahassee. Visitors will be able to explore the ties between outsiders’ perceptions of Florida, the experiences of those actually living in the region, and how these interactions shaped Florida’s settlement. Based on scholarly research and document translations, the maps on display not only depict the influence of Europeans on the future shape of Florida, but also reflect the continuity of various cultures and languages into the Florida we know today. Mapmaking tools, audiovisual content, and other 3-D objects will enhance the visitor experience; a series of educational programs will complement the exhibit. http://www.flhistoriccapitol.gov/exhibits/maps.cfm . 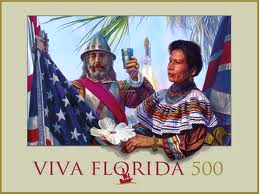 Florida claims 500 years of history and unmatched cultural diversity – a claim no other state can make. Happy Birthday, I say, and enjoy that 500-candle cake!